Black bandage dress from Herve Leger featuring a contrasting pink crossover panels to the bust, orange shoulder straps, a scoop back, concealed zip fastening to the back and pink panels to the sides. Ladies! Just when you thought life couldn’t get any better…..
Last month three stars — Kate Winslet, La La Vazquez Anthony and Glora Estefan — stepped out in the same figure-hugging dress by Stella McCartney. What makes this dress a must-have aside from the amazing price, are the black panels on the sides, which create the appearance of a super-slim hourglass silhouette. It’s like you’re airbrushed just by putting this on. The bust lifts, the illusion shifts upwards and it’s stunning. So Run, don’t walk to us.asos.com and get your “Skinny Dress” before there are none left. 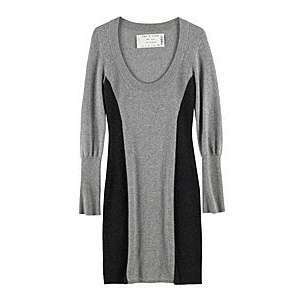 Ribbed metallic knit long sleeved dress. Round neck, leather trim detailing at neck and cuffs. Contrast jersey side panels. Back zip closure. Fully lined. Fits true to size. Cream and black 69% Cotton, 17% Acrylic, 8% Nylon, 5% Rayon, 1% Polyester 63% Cotton, 25% Nylon, 12% Elastane combo 100% Calf leather trim 100% Cotton lining Dry clean Made in the USA. All the cool people are doing it…looking skinny that is. We’ve seen Stella McCartney polka dot panel dresses on celebrities such as Jennifer Lopez, Kate Winslet and wannabe celebrities such as Kris Jenner. Oh no she di’ent! Now, not all of us can afford the McQueen & McCartney dresses, so let’s get our skinny on without making our bank account skinny with these affordable panel dresses. Hervé Léger Halterneck bandage dress on sale! Achieve figure-flattering perfection in Hervé Léger's halterneck dress. Its iconic bandage panels are known to deliver a bombshell silhouette meanwhile its contrasting front and back promise a sensational entrance and exit. We love it with ankle boots and a textured clutch for a downtown rooftop party.